A lot of conceptual art strikes me as being perhaps a bit [cough] lazy. The concept is forced to stand in for the elegance and beauty of masterful craft. But here is a sculpture where the concept and the craft are both amazing: the work doubles as a lovely artwork and as a story of truly ecumenical breadth. The synthesis is sublime. This is “Hollow” a 2016 sculpture by the Berlin-based Glaswegian artist Katie Paterson. “Hollow” is a folly grotto in the historic Royal Fort Gardens of Bristol. 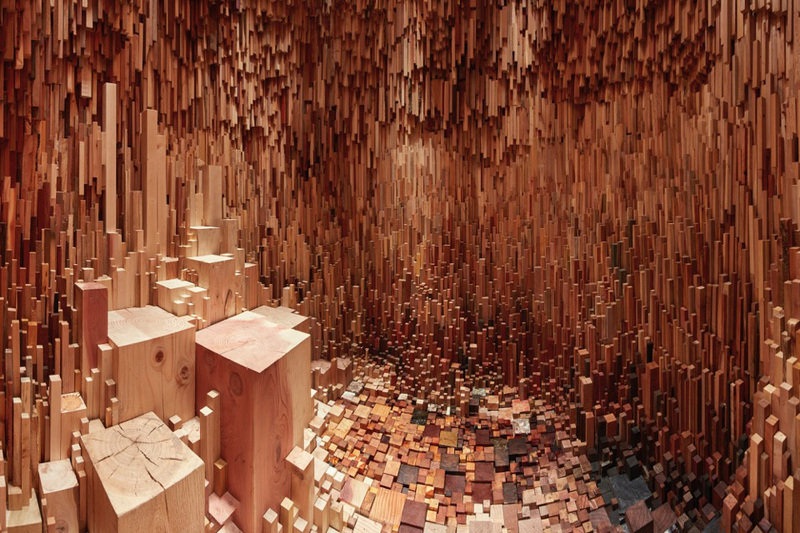 It looks a bit like a wooden megalith from the outside, but inside it becomes a magical proliferation of thousands of rectangular solids made of wood which give the simultaneous effect of a comfortable wooden grotto and an otherworldly scene from religion or abstract mathematics. The rectangular shapes are all wood and all clearly belong together. Yet the pieces are all different colors, densities and textures because they represents all trees…ever. Paterson traveled the world gathering more than 10,000 samples of every known species—from trees young and old; from taxa alive and those long extinct. There are petrified remnants of the first forests which sprang up 390 million years old, and bits of the horsetails which preceded those. There are slivers of genera long gone, which now exist only as rare museum specimens. There are pieces of historically significant trees like “Methusela” the oldest known Bristlecone pine…and from clonal colony giants like Pando. There are also hunks of historically meaningful trees like a surviving gingko from Hiroshima, the Fortingall Yew, and suchlike. There are human stories aplenty, but they are dwarfed and transcended by the majesty of arboreal diversity and development through the ages. The piece is indeed hollow and it is illuminated only by the Earth’s sun, as is entirely proper for a piece about trees (which live even more in tandem with our star, than other life forms—though each living thing depends on it). We humans come from an arboreal order, and the worship of trees is nearly universal (sacred trees sprout up up even in hardnosed monotheistic faiths like Islam and Christianity) yet trees are so much older than us…or even than mammals. The full story of trees exists in deep time which is difficult to comprehend in a meaningful way. “Hollow” is a microcosmic sculpture which endeavors to present a sliver of this complexity. The work succeeds in enshrining both the abstruse sacred quality of trees and the real nature of their diversity and long history here on Earth.